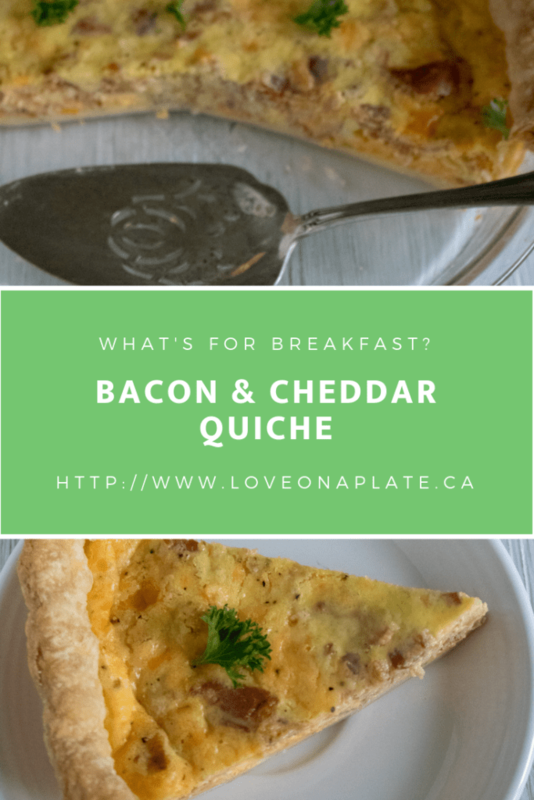 I really like a good quiche, classic breakfast flavours, baked with cheesy goodness in a flaky crust, what’s not to like? This recipe makes enough for 2 full quiches, and in my house that’s a good thing! My family of six gets to all sit down and eat a hot breakfast without the cook (ME) having to run around at the last minute ensuring everything gets done at the same time. 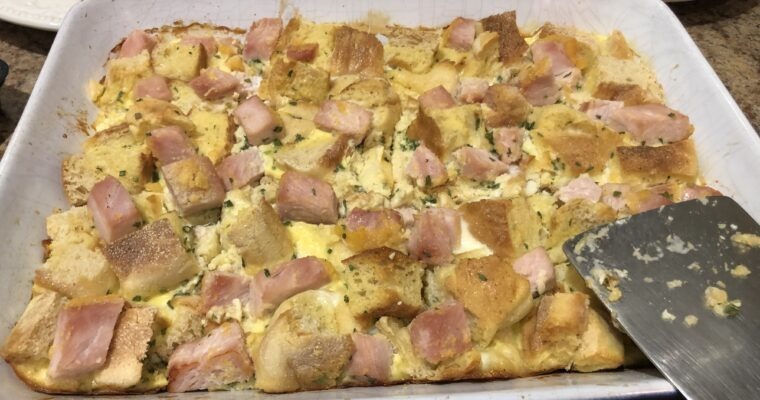 I usually serve this with home fries, and sliced fruit, which I can easily do while the quiche bakes and still have time to get in a cup of coffee before everyone gathers at the table. Like I said, what’s not to like right? But there’s more… We usually have leftovers, which I like to cut into slices, individually wrap for easy re-heating on those busy school days when I’m lucky if I can get everyone fed and out the door on time, and there are NO dirty dishes, WIN WIN right?! This Homemade from scratch Bacon & Cheddar Quiche takes some pre-planning if you choose to make the pie crust which has to chill overnight. It’s the chilling that allows the butter to firm up and make little tiny pockets of air as it bakes, that make your crust OH SO FLAKY and TENDER. Now I’ll be honest here, I sometimes (okay, often) use a store bought pie crust, and I’m okay with that. I normally use the frozen Tenderflake pie shells, but you can also use the ones in the refrigerator section, which makes the process so much faster and Tenderflake crusts are #FlakyPastry. If you like to Meal Plan, the tart shells or mini tart shells are a great way make breakfast for the week with very little work, and they taste great too. Okay, so let’s cook some Quiche! 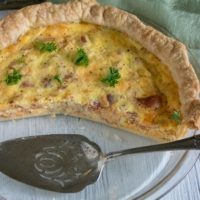 Classic bacon and eggs, baked up in a flaky homemade pie crust make this a special treat for the weekend. You'll need to plan ahead as the crust needs to rest overnight, but it's worth the extra effort. When you’re ready to make the quiche, preheat oven to 350. 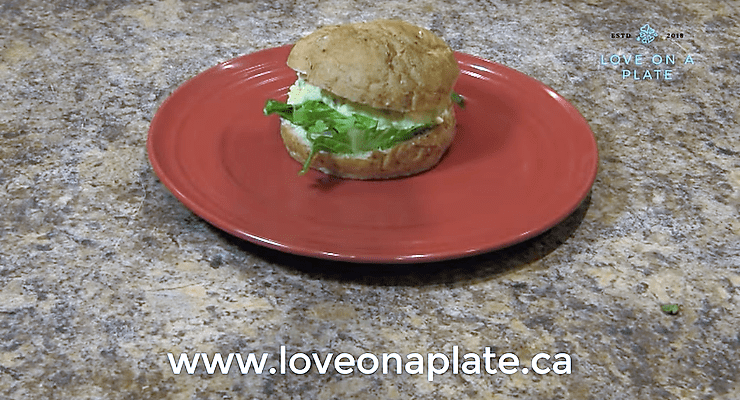 Roll out one of the pie Line pie dish with one of the pie crusts. Mix the corn eggs, heavy cream, milk, and salt and pepper.